Last Saturday evening as I sat amongst my ‘Team Thie’ team mates at Wahaca’s (this included Batman), I found myself listing of a load of concerns about what was to follow the next day…firstly, was Mexican food a great idea for myself and Carwyn when we had to run 13.1 miles in what were essentially sweat suits. How would I cope in the heat? 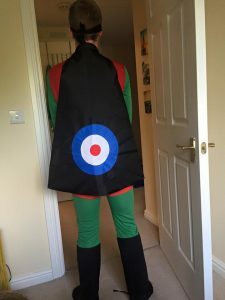 I wish I’d trained a little more in the outfit, it’s going to be painful running a half with a constant wedgie, and more importantly could we keep pushing our great cause and raise as much as possible for Rob. I was also a little concerned that I might fall over on live TV, as those that know me know this is the sort of thing that would normally happen to me. Actually come race day what almost ruined our plans was a concern that hadn’t even crossed my mind. 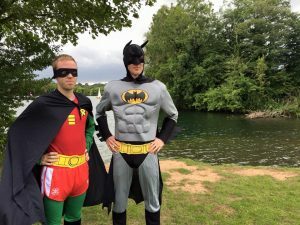 Underestimating how long a ‘last minute’ toilet stop would be involving a robin suit as opposed to shorts meant that I almost missed the start. Fortunately making it, Batman and I lined up amongst the elite’s. I imagined Rob watching the race and laughing at how ridiculous we looked! The gun fired and within a minute Carwyn looked to me ’It’s bloody warm!’. Neither of us had done anything fast in the outfits, in fact Carwyn had just waited until the day, looking back at it now that may have been for the best. Ignorance, it turns out, is bliss. We knew we had a long race ahead of us so we had planned to run 5.30’s per mile if we felt ok but had said we could always drop to 5.45’s if necessary. We passed through the first mile in 5.20 despite really heating up and struggling to even pick up our feet in the awkward costumes. Soon we found ourselves passing by others as we went through 2miles in 10.38. We just laughed to ourselves and agreed that we should ease off the pace a bit. Despite agreeing to do so we passed through mile 3 and 4 in a similar time. We continued to try to slam the brakes on as we worried about how we’d feel later on, but the sight of a large group of Welsh athletes just ahead of us spurred us along much to the delight of the roaring crowd. I’d like to say they were cheering us both on but it turns out that Batman is definitely the more popular of the two characters. 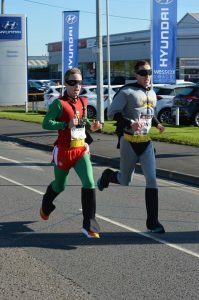 Running along to the chants of the batman and robin theme tune, five miles saw us in a strong group with Matt Collins, Phil Matthews and other Welsh athletes. It soon dawned on us that this was where the battle for the Welsh bronze medal was taking place. Carwyn and I had agreed that if we’d caught up with this group we’d sit in as Matt had said he was aiming for 70/71 minutes and always paces things well so it would be great to just get dragged around to such a quick time by the group. Passing through 10K in just over 33 minutes I started to get carried away as the crowd continued to urge us on. A quick telling off from Batman soon sorted that though and I settled back. As we headed down Lloyd George Avenue, the lack of visibility caused by the mask, added to the swinging weight from the GoPro, and being slightly delirious from the heat meant that I almost took out Matt Collins (for the second year running! I’ll get you next year Matt ;)). Carwyn gave a shout of ‘Sorry boys, we can’t really see much’. From that point, everyone gave us a wide birth. As we neared 8 miles the large group that we had been in had split as Batman, Matt and I moved off the front. Carwyn looked to be really struggling in the heat at this point and it later transpired he was really suffering with cramp. I found it a struggle in the Robin outfit but Carwyn’s had foam in it and was black so it was that much warmer. At this point he shouted for me to push on. I knew the pace was good and we were well inside the record but I hadn’t a clue what was going to happen over the next 5 miles. In past races I’d suffered really badly in warm conditions. It can come on suddenly sometimes, it’s just like flicking a switch. As I counted down the miles, I tried to take on as much water as possible to avoid this. Hitting 10miles at Roath Lake I found a new lease of life. Batman wasn’t too far behind, but the chants from the crowd, added to the fact that I know the lake very well as my training group have trained there for years really helped to push me along. As I pushed on through 11miles I spotted my massage therapist Paul Harris. He’s always taking the mick out of me and looked amused. It made me laugh and reminded me of how ridiculous I looked. That instantly took me back to the reasons behind this crazy challenge. I thought back to previous sessions I’d run with Rob around the lake, and how he’d dropped me so easily. Being such a great athlete he’s always someone I’ve looked up to. Running into the final bend, I realised I was actually on for a sub 70 half. This was far faster than we had anticipated. We’d initially said it would be nice to run around that time, but then after trying on our outfits we changed our tune. I finished in 69.32 in 18th, with Carwyn just behind in 21st in 70.47, surpassing our previous aims. To add to it, we finished 3rd and 4th in the Welsh Championships. I’d just like to also take this opportunity to publically apologise to Belal who has now become a household name alongside Batman and Robin. Thanks for being a great sport mate! The response we’ve had following the half marathon has been absolutely incredible. With the help of the BBC Sports video going viral, we’ve managed to raise £4000 so far with many donations coming from very generous people from all round the country. Many thanks to all of those who have donated and the kind messages you have sent us. We plan to keep the donations page open for just over another week so please continue to share.